Punching machine Manipulator is a pneumatic cylindrical coordinate manipulator, which is used for automatic load and discharge of presses. Manipulator has three degrees of freedom: arm Telescopic, arm in the horizontal swing around, finger movements, these three movements are driven by the cylinder. The upper arm has a section of machined rack, which engages with the gears. When the arm telescopic cylinder pushes the piston rod for reciprocating movement, the gear rolls on the fixed rack, thus driving the arm for telescopic action. The cylinder is the arm of the swinging cylinder, it pushes the rack for reciprocating movement, so that gear rotation, so that the whole arm part of the left and right swing. The upper and lower movement of the finger is driven by the finger lifting cylinder, here, the finger is three air flow negative pressure type sucker, when the sucker drops clings to the piece material, to the nozzle person compresses the air, the sucker is about to absorb the piece material, cuts off the gas source, the sheet material falls. 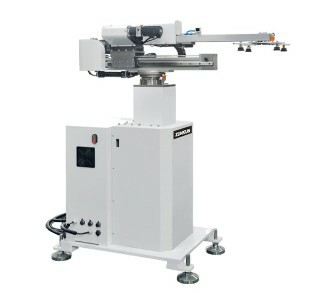 Press slider downward, the manipulator suction material, the material suction, the fingers rise, arm counterclockwise swing to the direction of feeding, waiting for feeding. When the slider reaches the bottom dead end, the arm telescopic cylinder moves, the arm begins to stretch forward, after the slider rises, the finger carries the piece material into the mold center position, the piece material puts the person mold, the arm begins to retract, to certain distance, the arm swings the cylinder to begin the movement, causes the arm to swing clockwise, simultaneously continues to shrink. When the arm is fully retracted, allow the slider to fall, when the finger reaches the top of the storage barrel, the arm stops swinging, the finger telescopic cylinder begins to move, the finger drops the suction slice, starts the next cycle. The sheet material is stored in the storage barrel, below has a can lift the pallet, the pallet's fluctuation is relies on a small electric motor through the belt transmission, the worm wheel pair drives the lead screw to realize. A non-contact stroke switch is arranged at the upper end of the storage barrel, as the sheet material is constantly taken away, the height of the stack is gradually reduced, when the upper plane of the stack is lower than the no contact switch, the small motor starting pallet rising, waiting for the stack to rise to a certain height, no contact switch and cut off the power supply. The stack stops rising so that the upper plane of the stack is always at the height the finger can reach. The above is about punching machine working principle of the detailed introduction, Little friends understand?